Buy Strain Hunters Big Tooth Feminised Seeds from dope-seeds.com today where you will find the best price for cannabis seeds online. 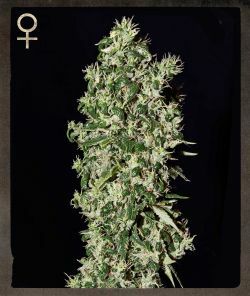 Strain Hunters Big Tooth Feminised Seeds are a great value cannabis strain that would be a great addition to anyones cannabis seed collection. The Big Tooth grows fast and very vigorous. It has a very good resistance to pests, mould and cold temperatures. It is a very bushy plant with medium sized internodes and tends to branch out very well if the size of the root system allows it. The leaves are large with long leaflets, non-overlapping. The buds grow irregular, pear-shaped, often fox-tailing. Calyxes are round, small, covered in resin. The smell is very penetrating, complex. The effect starts on the indica side with a fast onset, then evolves into a mind-altering giggly one. Medicinally used for appetite stimulation and as an antidepressant.